Letter rank on map selection screen has funny behaviour? · forums · community | osu! Letter rank on map selection screen has funny behaviour? Here I have two As, but since the B has a higher score, the rank displayed over at the right shows B. This might be intended behaviour, but I don't see how it's desirable. 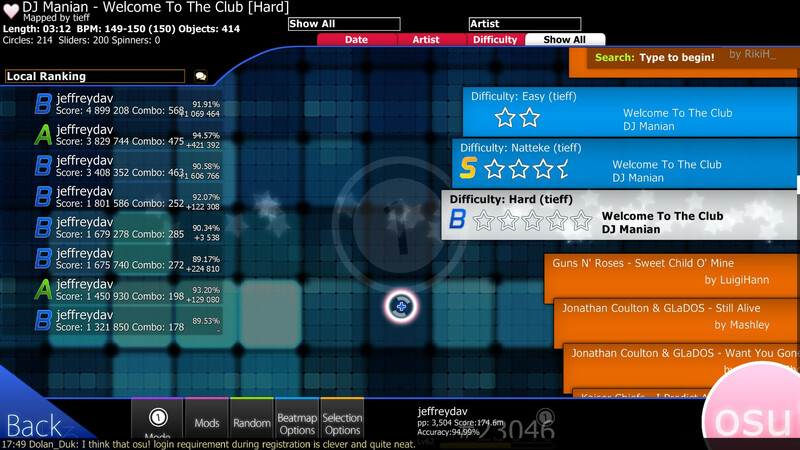 For instance, it's possible to decrease the displayed rank by beating your highest score while getting a lower rank. Last edited by jeffreydav April 5, 2013 at 4:09:58 PM GMT , edited 2 times in total. Last edited by Marcin April 5, 2013 at 4:22:17 PM GMT , edited 4 times in total. You have made S offline, but you had B rank before - B rank will remain on difficulty select. You made A rank with 128 combo, but B rank with 500 combo, - B rank will remain, because A rank had less score. Why is it silly? It displays what your current online score is. I wouldn't want it to show an S when my online score is an A etc. Local score: Try getting SS with some easy mod on. Now get S (or even A, if you have sufficiently high combo) without that easy mod. Which one do you prefer to be displayed? Although for same mod selections, I do agree that the better rank should be displayed. Actually, at one time it was showing your highest rank letter, but that was apparently silly and it went away. Letter grades really don't mean that much, it's easy to have a soft-S, where the play is so filled with slider breaks that a B or even C could beat it. If an S isn't good enough to stand up against a B play, then it really isn't worth more than one anyway... it's better that that S does get buried until a real S comes along. The local scoreboard is always there if you want a more complete view anyways.